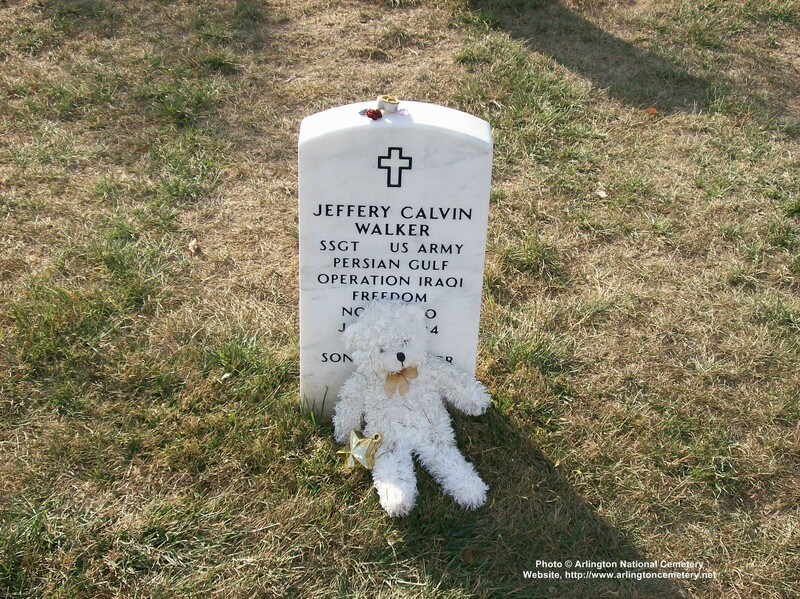 Sergeant Jeffery C. Walker, 33, of Havre de Grace, Maryland, was killed January 8, 2004, in Fallujah, Iraq. Walker was onboard a UH-60 when it crashed while on a MEDEVAC mission. He was assigned to Company C, 782nd Main Support Battalion, 82nd Airborne Division, Fort Bragg, North Carolina. The names of eight other soldiers killed in the crash of this UH-60 were released in two previous news releases earlier today. A week ago, Johnny and Jeanine Walker put together a care package to send to Iraq for Johnny's brother, Army Sergeant Jeffery C. Walker. It was a hodgepodge of comforts from home: a few magazines favored by the car and fitness buff; a container of skin lotion to protect against the desert sun and wind; beef jerky; and a DVD of a martial arts film called Volcano High. They mailed it Monday. Three days later, the 33-year-old paratrooper boarded a Black Hawk UH-60 helicopter on a routine medical flight to Baghdad. It crashed near the Sunni Muslim town of Fallujah, where many Iraqis are hostile to the American occupation, killing all nine soldiers aboard. The Army has just released the names of the victims. Although Thursday's crash remains under investigation, witnesses described watching a ground-fired rocket hitting the helicopter and breaking it in two. Some of the five passengers were headed for medical treatment aboard the helicopter, which the Army said was marked with a large red cross. An Army spokeswoman said yesterday that officials were not sure why Walker was on the flight. The deaths brought the total number of U.S. soldiers killed in Iraq to 494. Of those, 356 have died since May 1, when President Bush declared major combat over. Walker, a 1989 Havre de Grace High School graduate who traveled the world in his 14-year military career but considered Maryland home, was the fifth state resident to die in the war. "It's tough, so tough," Johnny Walker, 36, said yesterday in his Germantown house, where his brother had celebrated his 33rd birthday in November, days before shipping out for Iraq. "We actually got closer as we got older. We communicated a lot more. We were looking forward to growing old together." Johnny Walker thumbed through old snapshots of his brother - a curly-haired toddler in Seoul, Korea, where they were born to a Korean mother and an American father; a growing child in California, Texas, Panama and Maryland, as they followed their father through his Army career. The boys settled long enough in Havre de Grace to attend high school. Then their paths diverged: Johnny attended the University of Maryland, College Park, earned an engineering degree, married Jeanine and stayed in Maryland to pursue a career as a software technician. 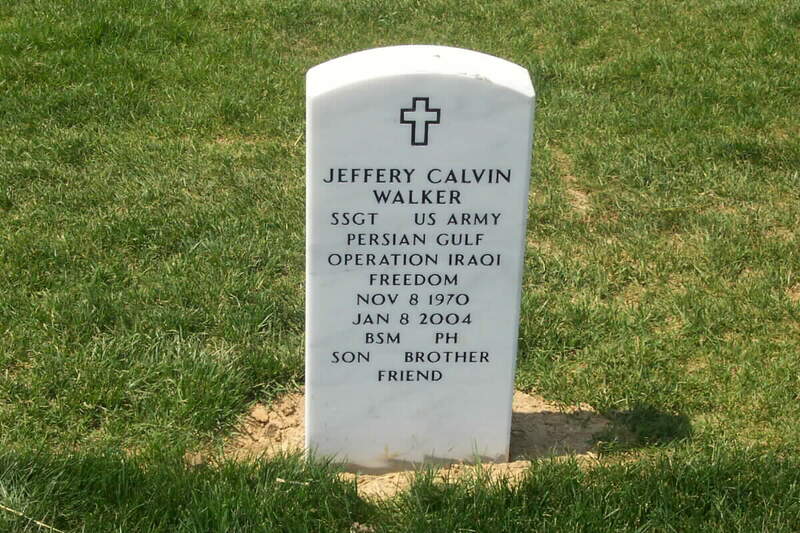 Jeffery joined the Army shortly after graduation, training as a welder, completing airborne school - he snapped a picture of himself during one parachute jump by holding the camera at arm's length - and serving in Korea, Germany, the Balkans and the United States. Because their parents had divorced when they were young, and with their mother now living in New York and their father in Texas, Jeffery spent many holidays and vacations at Johnny and Jeanine's house. He would fly in from his latest assignment to relax for a few days, usually laconic about his military work but enjoying talking "girls, cars, computers," Johnny Walker said. Recently, while stationed at Fort Bragg in North Carolina, he would hop in his Acura and drive north for visits. His odd hours and preference for sleeping on the floor seemed to reflect the habits of a military life, his brother said. "We would just hang out, really," Johnny Walker said. "He traveled so much, he just wanted to be here at home. This was his home base." In one snapshot, a muscular Jeffery Walker has tucked his head into his T-shirt and allowed a far scrawnier pal of Johnny's to pose his face atop the soldier's brawny shoulders. Those were the kind of low-key good times they shared on his visits, Johnny and Jeanine Walker said. On his last visit in November, Jeffery arrived with his girlfriend from North Carolina and marked his birthday with take-out food and an ice cream cake. The knowledge that he was headed for Iraq hovered over the festivities. Once, after opening several presents - mostly gadgets to go with his new digital camera - Jeffery Walker pronounced himself "overwhelmed" and paused in silence, evidently thinking about his deployment. But he said nothing of any fears he may have had, his brother said. "He'd decided to make a career of the military. 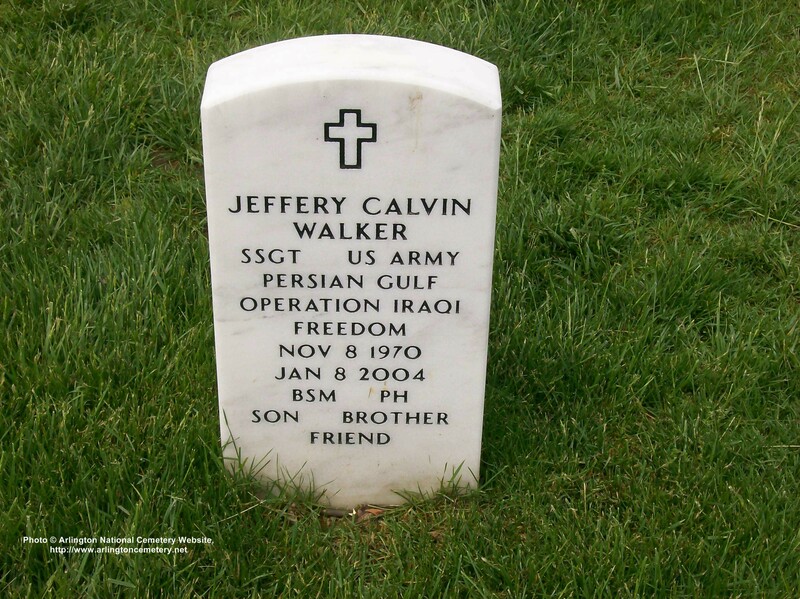 He loved serving his country," Johnny Walker said. In recent days, Christmas presents arrived at the Germantown house - surprises from Jeffery, ordered by phone or e-mail from Iraq: a watch for Johnny, a porcelain figurine of a boy carrying a balloon and a toy horse for Jeanine. A Christmas card arrived with a short letter penned in Jeffery's neat handwriting on a page torn from a notebook. Dated December 11, 2003, it is a mix of pride and gripes with a few hints about the danger. "We're really working hard over here," Jeffery Walker wrote. "Sometimes we go to work at 7 a.m. and get off at 2 a.m. ... Sand and guess what? More sand! The sooner we get done with the mission here, the sooner we can get home! Same old thing day in and day out. I've been on a couple of convoys, but you really have to keep your peepers open for snipers and kids throwing rocks. Other than that everything is cool." On Thursday, a few days after the letter and card arrived, Johnny Walker arrived home and saw an uniformed man doff his cap and walk toward him as he stood outside his garage. He knew immediately what the officer's arrival on the dark suburban street meant, but the casualty notification officer waited until they were inside, seated on the sofa, before delivering the terrible news. Now everything associated with Jeffery has taken on new meaning. A brief phone message, left by Jeffery Walker at 1 a.m. one morning and containing just good wishes, is still on the answering machine. His brother and sister-in-law say they won't erase it. A military funeral at Arlington National Cemetery, as well as a memorial service at Fort Bragg, are planned but not yet scheduled.